With the Outlook Inclusion Calendar™ all of your staff can keep track of key dates in 2019 – including religious days, festivals, holidays and important diversity dates. 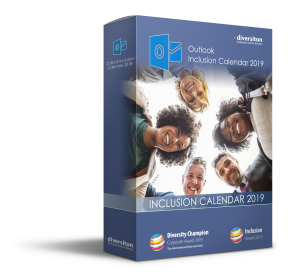 The Outlook Inclusion Calendar™ will help to ensure that your staff don’t miss any important celebrations in 2019 or plan events when parts of the workforce cannot participate fully. The Outlook Inclusion Calendar™ is fully editable – which means you can add your organization dates – such as work events, training courses, meetings, holidays or project schedules. It is highly accessible as it works great on laptops, smartphones and tablets. 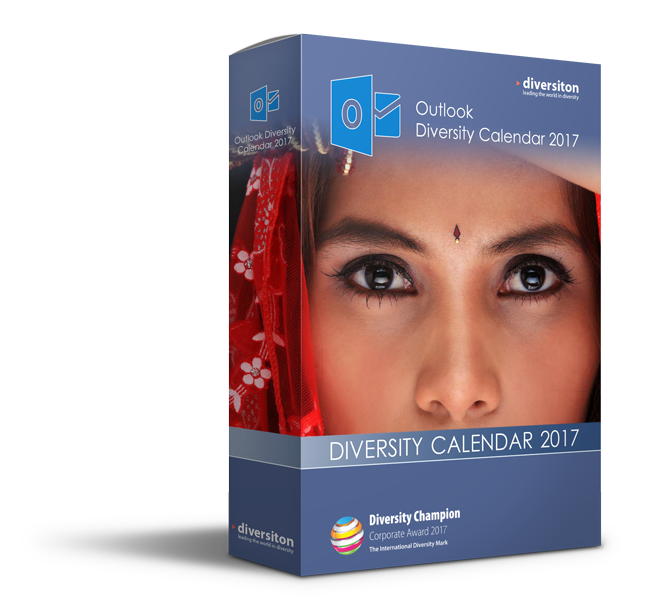 The Outlook Inclusion Calendar™ offers incredible value for money at just £395. You just need one license for your whole organisation – irrespective of the number of staff! This is a practical and cost effective way to promote diversity and respect throughout your whole organisation – for all of 2019! We can also customise your Outlook Calendar with your Organisation events! Simply provide us with a schedule of important work dates and we can build these into your Outlook Calendar. We can also include your information on events so this is available when employees click on the date. Wherever you are based (U.S. or Australia for example) we can also ensure your Country holidays and important dates are included. You can purchase the Outlook Inclusion Calendar at a special discount when you order a Bespoke Online Inclusion Calendar. This means your staff can access all the key date information by PRF or OUTLOOK! TWO CLICKS – and you’re all set up! We will send you an email with your Outlook Inclusion Calendar™as an attachment. You just click on the little calendar icon and your Outlook Inclusion Calendar™ will open alongside your normal outlook calendar. If you would like to use the combined view, then click on View tab at the very top of your screen and then click Overlay – That’s it! PRODUCT DELIVERY – We forward the Outlook Inclusion Calendar™ as an email attachment to distribute as you wish to all staff. The Outlook Diversity Calendar™ is created in Outlook 2016 and works with all versions of Outlook. OPENING your 2017 Outlook Inclusion Calendar™ – You just click on the little calendar icon attachment in the email – and your Outlook Inclusion Calendar™ will open alongside your normal outlook calendar. The Outlook Inclusion Calendar™ sits beside the user’s Outlook Calendar – it does not need to be installed on a server. COMBINED VIEW OPTION – If you would like to use the combined view (with your dates and the diversity dates all in the one frame), then click on View tab at the very top of your Outlook screen and then click ‘Overlay’ – That’s it! FORWARDING your 2016 Outlook Inclusion Calendar™ – To forward the 2019 Outlook Inclusion Calendar™ to other staff go into your Outlook Calendar as normal. On your left hand side panel near the bottom you should see a tab that says “outlook diversity calendar’. Right click on this calendar name, then click on SHARE, then EMAIL CALENDAR. This will take you to the email message and you just click OK in the ‘send a calendar via email’ box. Within a few seconds the calendar will be imported into your email as an attachment ready to be sent – to all staff. INSERTING YOUR OWN DATES into your 2019 Outlook Inclusion Calendar™ – You can easily insert your own organisation diversity dates into the calendar. Just click on the relevant date, then new appointment and add the details.